Elemental Tech Multipliers are determined (with some exceptions) by the Tech level, higher the number, then higher the chance of that element procing causing splash damage. Elemental Prefixes do nothing for a gun except add something like 1_Common rarity level to it. But, yes, they do correlate nicely with naming. These prefixes are applied to some guns when the above supposed effect is already met, i.g. specific parts with tech or titles/prefix produce a weapon with a x4 fire elemental multiplier, then the game engine may, after the condition is met, slap-on Prefix_DTIncendiary_4 Combustion to it (e.g. Hx 530 C Combustion Hellfire). Very Important: There are also some base damage changes, depending on the Manufacturer of the base weapon. On top of the modifiers below for the Manufacturer type, there are also "Material type" modifiers for each Manufacturer. 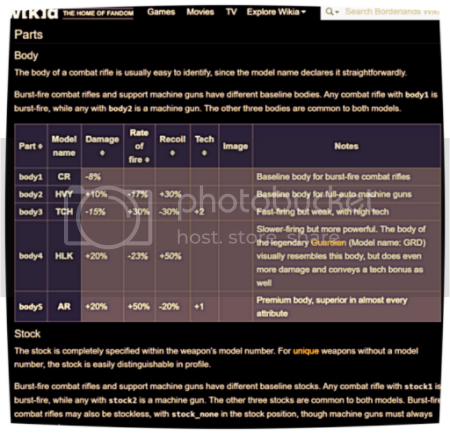 These are presented as "gd_weap_shared_materialparts.ManufacturerMaterials.Material_Manufacturer tag from below table_Level Number"
The rest of this list I have updated as single part weapons on an Atlas base. Different effects may result from combinations. acc.acc2_Intense - 15% - 2 - increases accuracy, gives a +50% critical hit bonus and increases tech. acc.acc4_Deathly 20% - - - 25% "Deathly"/ reduces recoil and increases damage. Barrel.barrel4 30% 30% - - -35% has the highest damage and average accuracy. Barrel.barrel5_Hyperion_Destroyer 18% 130% - 5 50% 10000% burst fire count when scoped. Fully automatic when zoomed. Body.body3 -15% - 30% 2 30% "TCH"/ increases fire rate, decreases damage, reduces recoil, and adds tech. Body.body4 20% - -30% - -50% "HLK"/ increases damage, decreases fire rate, and adds alot of recoil. 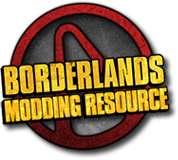 Body.body4_Tediore_Guardian 25% - -30% 3 -50% Ammo regen rate 30%. "GRD"/ [Combat Rifles only]increases damage, reduces fire rate, adds alot of recoil, adds alot of tech, and adds ammo regen. Body.body5 20% - 50% 1 20% "AR"/ [Preferred] increases damage, greatly increases fire rate, and reduces recoil. Grip.grip2 - - - - - "Vladof"
Grip.grip5_Gearbox - - - - - "Gearbox"
mag.mag1 - - - - - offers no stat bonuses. mag.mag1a_pounder 52% - -200% - - Add -6 rounds. 40% reload speed. -200% burst fire count, changes the rifle into a single shot weapon with high damage, low fire rate, and reduced clip. mag.mag3 - - - - - Add 6 rounds. -30% reload speed, increases the clip size while slowing reload speed. mag.mag3_Dahl_Raven - - - 3 - Add 9 rounds. -30% reload speed, 200% burst fire count, Fires 5 round bursts instead of 3. Prefix.Prefix_Acc2_Intense - - - - - "Intense"
Prefix.Prefix_Acc3_Deathly - - - - - "Deathly"
Prefix.Prefix_Damage1_Punishing 20% - - - - "Punishing"
Prefix.Prefix_LowDamage1_Short - - - 3 100% 60% reload speed. "Short"
Prefix.Prefix_Mag2_Support - - - - - "Support"
Prefix.Prefix_Technical - - - - - "Technical"
Stock.stock4 - - - - 80% -20% reload speed, gives greater recoil reduction and slightly slower reload speed. Title.TitleM_Dahl_Raven - - - - - "Raven" "2 more bullets make all the difference"
Title.TitleM_Hyperion_Destroyer - - - - - "Destroyer" "The destructor has come"
Title.TitleM_Tediore_Guardian - - - - - "Guardian" "Hold your ground… Forever." Title.TitleU_Retail_Sentinel - - - - - "The Sentinel" "A watchful eye"
Title.Title_Accuracy1_Cobra - - - - 40% "Cobra"
Title.Title_Damage2_Stomper 50% - - 2 - Decrease bullet velocity. "Stomper"
Title.Title_Mag1_Pounder 10% - - - - "Pounder"
Title.Title__Rifle - - - - - "Rifle"
UniqueParts.Sentinel_Material - -35% - - - Increases reload speed at the cost of Spread/ 50% reload speed. 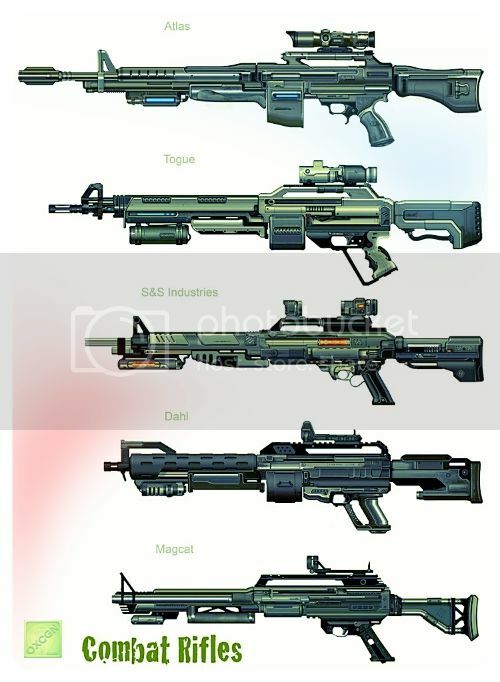 Combat rifles fall into two families, differentiated mostly by their magazines: combat rifles proper, sometimes called burst-fire combat rifles, and machine guns (sometimes called support machine guns) capable of fully automatic fire. Operationally, the two families differ strongly. Combat rifles have smaller magazines that reload more quickly, firing a short burst of shots with each fire command, while machine guns have larger magazines that reload more slowly, firing continuously. Other than magazines, the two families share most parts, though certain accessories are specific to one or the other, and there are also certain family-specific bodies, sights, and stocks.